Hello cuteness! I am just loving the accessories that sweet Nicole of the lovely poppy is creating. So many great colors, textures, and combinations of media. She's got jewelry, hair clips, camera straps, even dog collars! This girl can do it all! Q: What is your earliest memory of crafting? A: My earliest memory of crafting is making a "learning bear" in my middle school family and consumer education class. Learning bears were mandatory projects for all middle school students to complete. They were made out of felt and the legs and arms were detachable (gotta practice the buttons, right?). My dear mother was my teacher and I wanted to make sure mine was the best in the class. After a good fifteen tries, my pink and yellow learning bear was assembled- full with buttons and button holes. To be honest, I don't really like sewing projects and can't handle anything that takes more than and hour and a half. That's why I've decided to stick to jewelry, camera slipcovers, and dog collars. Q: What are your muses? A: I'm inspired and encouraged by the other bloggers. if I'm contemplating a new product release or wondering what to blog about next, I turn to my new blogging friends. It's great to the support of other crafty ladies who have the same goals and visions as myself. Pinterest has also been a HUGE inspiration and a great place for ideas. Pinterest also has become a serious addiction of mine. In fact, since writing this I've jumped back to it three times. A: Although I'm new to blogging and am constantly trying to find my niche, blogging has been a creative outlet. I love, love, love reading about other blogger's inspirations and their stories. Q Favorite musical artist or type of music? A: I pinky swear I didn't pick these two because they both live in Nashville, but my two favorites are Matt Wertz and Ben Rector. One of the (many) reasons why I love them is because they are unique and are still fairly unknown, which means it's easy to get tickets to see them live. They also are two of the most down to earth artists that I've ever known (you're right, I don't really KNOW them). Q: If you could see your accessories on any two celebrities, who would you pick? A: Hmmm, I'd be just as happy seeing any of my accessories on "one of us" as I would be a celebrity. Visit the lovely poppy and come back and tell me what you love most! Her designs are lovely, so reasonably priced, too! Do I really have to pick just one thing? Impossible, my friend. Because I can't just pick one, I've picked a package (sneaky, hm?). It includes the AMAZING Francesca Necklace and her adorable mum ring! Love love love love LOVE. I've been looking for the perfect wedding necklace, and I think I've found that in Francesca! ...also just "liked" the lovely poppy! i have to say that i am honestly in love with all the pieces at the lovely poppy - couldn't be happier that you introduced me to this store!! If I were lucky enough to win this gift certificate, I would put it towards the argyle poppy petal headband to preppy up my boring work clothes, as well as the carly multi blossom necklace to wear when out with the girls! lotsa love! #3. Now following The Lovely Poppy blog - via my personal Google account! #5. 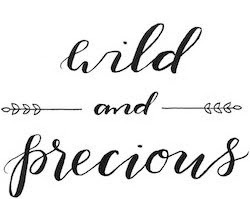 Already a fan of Wild & Precious on Facebook!! The madeline! such great jewelry! I love the madeline necklace. i love the Adjustable Chrysanthemum Mum Rings, so precious! and i follow wild & precious of course! and follow nicole now too! I follow Nicole's blog, too. I follow you on fb as Dorottya Zsófia Bacsi. I follow Nicole on fb as Dorottya Zsófia Bacsi, too. Ok - I hate having my first comment on a blog be for a giveaway but...I was JUST thinking that I needed a new statement necklace and I think the 'The Meredith- Rosette Bib Necklace' is PERFECT! I love The Carly necklace! Thanks for the chance! I added the lovely poppy to my favorites. I like the lovely poppy on Facebook. I really love Pink Rosette Row Headband! I just "liked" The Lovely Poppy on facebook! Im following The Lovely Poppy on her blog! I love the Polka Poppy Petal Headband. I just liked "the lovely poppy" on Facebook! The Meredith- Rosette Bib Necklace and the one you have on! i'm a follower. nicole's stuff is super cute! Love it all...especially the Francesca & the rolled blossom headband. I like the Flower Fiesta Camera Slipcover! Added The Lovely Poppy to my Etsy favs! Like The Lovely Poppy on FB! Love the Carly //sweet ivory combo//- Floral Blossom Necklace!! Everything is beautiful & Stylish!! I love the Subtle Rolled Blossom Headband. so cute! My favorite item in the shop is the Carly sweet ivory combo flower necklace! Liked Wild and Precious on FB! Liked The Lovely Poppy on FB! I love the Carly and Francesca necklaces! Thanks for the giveaway. I follow The Lovely Poppy blog. Love the subtle//natural//rolled blossom headband. I follow @blarita on twitter. I love Pretty Poppy Sale Package. Christina - xristya@rock.com - I love the Pink Mini-Blossom Headband! I love the Francesca necklace in green, such a pretty color! Also following Nicole's blog now! I just started following your Twitter account. I'm following Nicole's blog via GFC as barniegirl! I "hearted" The Lovely Poppy on Etsy as barniegirl! I "liked" Wild & Precious on Facebook as Alyssa J D.! I "liked" The Lovely Poppy on Facebook as Alyssa J D.! What i love the most is the The Francesca- Pink Pearl Floral Blossom Necklace. though all the flowers are beautiful, i fell in love with the newsprint dog collar!